The ancient puranas of India are huge volumes containing stories of the makings of the universe as well as thrilling tales of innumerable gods and goddesses. The geography of the puranas coincides with that of the entire Indian sub-continent. Their stories are honored in many ways, not least of which is the recognition of place. Countless places mentioned in these ancient texts are fully alive today and are important places of yatra (pilgrimage) where vast temple complexes have arisen. Within their sanctums worship is performed daily to the resident gods and goddesses in a tradition that reaches back many hundreds of years. These places where the sacred stories happened are sometimes called tirthas. A tirtha is a place of crossing over and most literally refers to fords of rivers. It also refers to a spiritual crossing place, where the divine is more easily intuited, recognized or experienced. The magnificently constructed temples of South India, planned according to strict rules of vastu (laws governing spatial awareness), are often dominated by huge towering gateways called gopurams. Daily, vast numbers of Hindu yatris (pilgrims) pass through the gopurams to have darshan of their favorite gods or goddesses, enshrined in the murtis (images) in the temples’ inner sanctums. Darshan is both seeing and being seen by the deity. 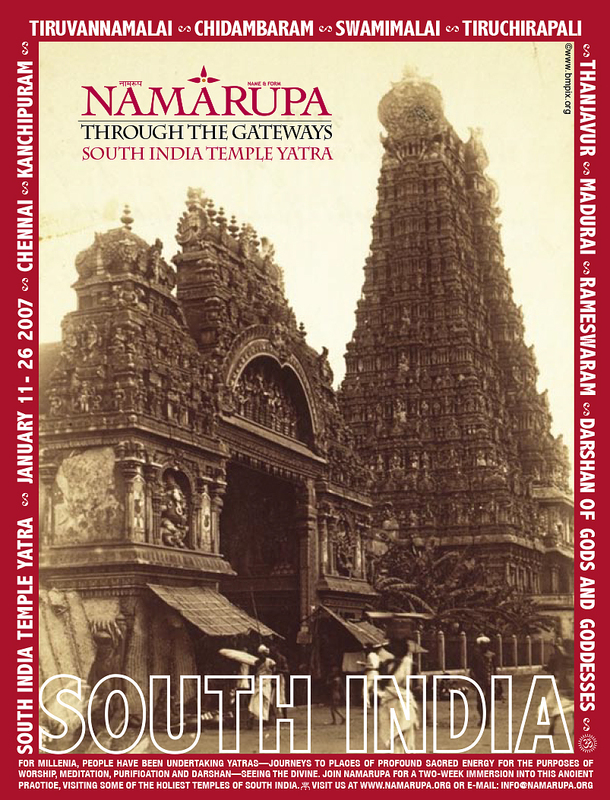 The intention of the NAMARUPA Through the Gateways South Indian Temple Yatra will be to go as much as possible as pilgrims to the sacred temples and, where permitted, to have darshan of the gods and goddesses. This will not be tourism. We will travel simply, lodge in Indian-style accommodations, eat vegetarian meals and dress and behave appropriately according to local custom. Where possible we will also have time for practices such as yoga asanas and meditation, as well as discussions and explanations regarding our experiences. Arrangements will also be made with local priests for the proper performance of any rituals that we may wish to perform. At some places we will have ample time for the usual sightseeing, shopping and exploring that travellers enjoy. The pace will be relaxed, but this being India, one can expect the unexpected. At the outset we will all meet in Chennai and spend some time in preparation: purchasing the proper clothes for visiting temples and explaining the various customs, rules and attitudes which will be helpful for a successful yatra.